Wayne Rodney Schneider, Antonio Bagnato Antonio Bagnato was convicted of the 2015 murder of HA Wayne Schneider and sentenced last year to the death penalty. 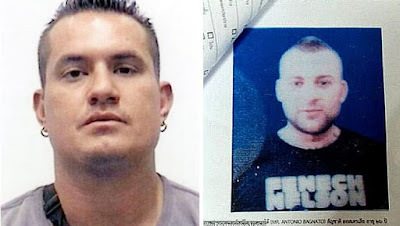 The former kickboxer was the bodyguard of Schneider, who was kidnapped and bashed to death near Pattaya. Bagnato saw the murder charge overturned, and was instead sentenced to three years for assault. It is reported that Thai police will re-arrest Bagnato immediately on separate charges. The murder of Schneider is believed linked to a wider criminal network smuggling meth from Thailand to Australia. Australian HA Luke Cook was convicted of helping Bagnato flee to Cambodia after Schneider's murder.